Eric Chastain woke up Thursday morning to what he thought was one of his pets making a racket. "And then it got louder and louder," said Chastain, who lives in Arlington. "And you heard it more often." Looking back now, he wishes it had been his pets. "The skies opened up," said Chastain. "And it turned out to be glass, hail and water in the living room." 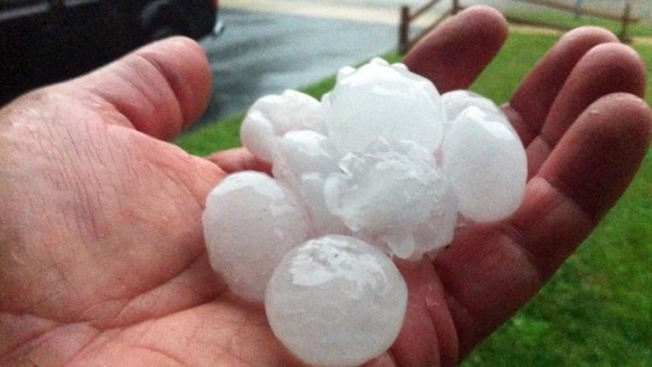 Golf ball-size hail shattered both of his skylights. When he saw it falling in the middle of his living room, he immediately pushed his couches out of the way and put plastic containers below. Listening to the storm pass over his house, he was amazed when he went outside and saw just a few dents on his car. His windshield and windows were still intact. That's not all the storm did. Hail smashed the back windows out of three Arlington police cars parked at the department's West Substation. It also forced Arlington Parks and Rec to close a popular city golf course and cancel a spring break tennis camp. The damage kept local contractors' phones ringing all day. And while Chastain waited for his to show up Thursday, he said at least he's got a good story to tell his friends and family. “So I’m happy that if it had to happen it was going to happen while [my wife and I are] both here and we can take care of it as quickly as possible," said Chastain.